I would not object today to a long confidential chat with you - but O! pshaw! I can't - The folks are on their way from church - all have their handkerchifs over their bonnets. Am glad I did'nt go. 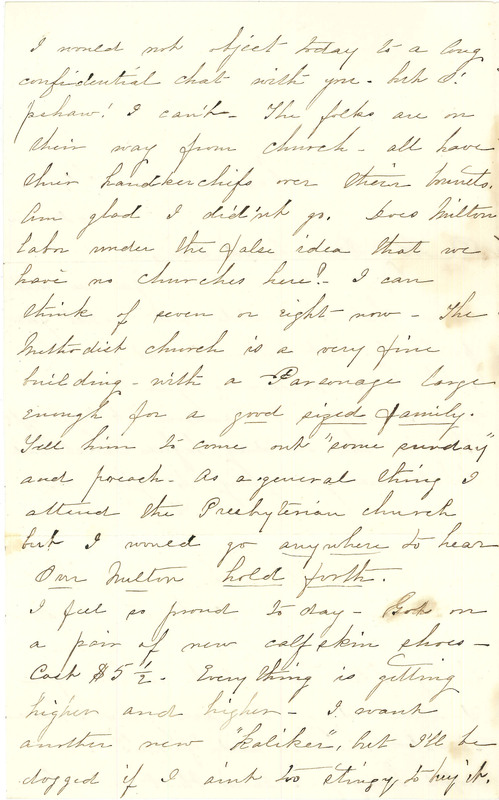 Does Milton labor under the false idea that we have no churches here?- I can think of seven or eight now - The Methodist church is a very fine building - with a Parsonage large enough for a good sized family. Tell him to come out "some sunday" and preach - As a general thing I attend the Presbyterian church but I would go anywhere to hear Our Milton hold forth. I feel so proud to day - Got on a pair of new calf skin shoes - Cost $5 1/2. Every thing is getting higher and higher - I want another new "kaliker", but I'll be dogged if I aint too stingy to buy it.